When I first challenged myself to Plastic Free July last year, I failed badly. I wasn't prepared, I had no clue where to start, and I felt way over my depth. EVERYTHING IS IN PLASTIC, was my conclusion; so how the heck do I suddenly change all my habits?? Natural Nation literally read my mind, and have created a range of Plastic Free July starter boxes that do exactly that: start you off on Plastic Free July (and hopefully a plastic free LIFE) the right way. Natural Nation is spearheaded by Amy; a beauty therapist, and natural health and skincare enthusiast. Her Auckland based business grew from her love of all things natural and eco-friendly, and evolved as she continued to change things in her own home. Amy makes her own natural healing solutions and products, but also incorporates a range of other brands who are plastic-free and stem from the same earth-loving values. Each box includes items such as bamboo pegs, cotton buds, dish brushes, dish clothes, bamboo toothbrushes, produce bags, and so many other plastic free goodies. I've been utilising The Mid Range Box this Plastic Free July, and here's what I think of my top favourite 3 products. These pegs are strong and durable, and come with instructions of what to do at the end of their life too; simply remove the metal wire and recycle, and place the bamboo peg in your compost bin! I love how they are sturdy for bigger things like towels and sheets, but don't leave huge marks on the clothing like so many plastic pegs do. My mum was jealous and bought some herself too, and can't stop talking about them either. If these didn't exist, my veggie man at the farmer's market would be very frustrated. These produce bags mean there's no awkward juggle at the end of your grocery shopping as you balance 8 apples on the scales, refusing those nasty little plastic bags, but all the while holding up a huge line of impatient people behind you. The bags keep my produce fresh in the fridge, as they are breathable so don't make them sweat. I can chuck them in the wash whenever they get grubby, and they fit nicely in my glove box or handbag as a back up. I'm often asked 'how the heck do I start a plastic free lifestyle?' and I'm so grateful Natural Nation have come up with this handy solution. 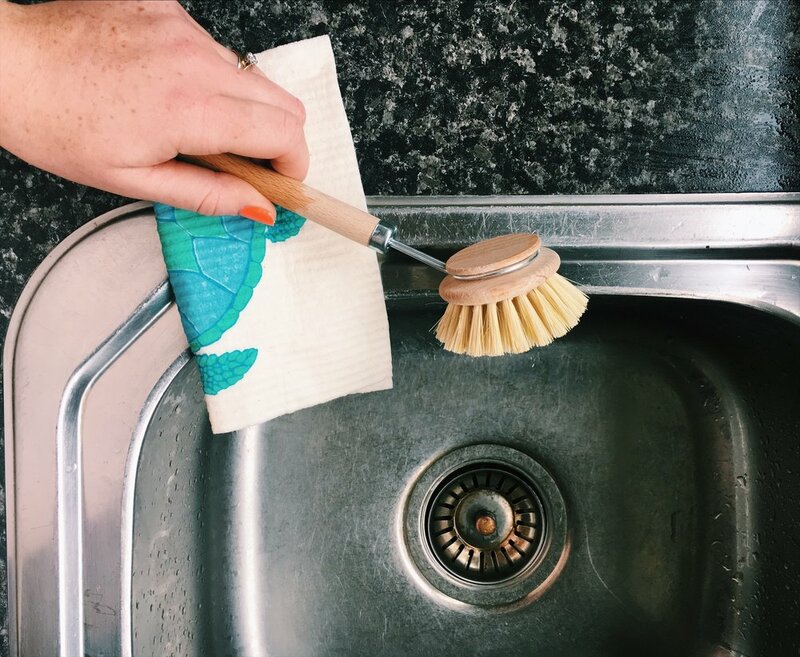 There are hundreds of plastic free swaps you can make, but starting with a box curated by someone who knows the busy life of a working mum and family, means half the job is done for you. As a conscious consumer, it's important for me to know who curated the boxes, and who makes my National Nation beauty products. I asked Amy a few questions so we can all get to know the lovely lady behind National Nation. What does the day in the life of Amy look like? After waking up ( I am desperately not a morning person), I start the day with coffee, while making breakfast/lunch for my son Rico and getting him off to school. Then I'm back home and out to my little office that is off our house. I fire up the computer, get orders packed, and do all my admin for the day. Once this is done I will usually plan or make stock for Natural Nation Exclusives. I then pick Rico up from school and get back to the mum grind. I try really hard to give Rico my afternoons, so after bedtime I catch up on anything else that needs doing before bed. So sleep, mum, work, mum, work, sleep. I started Natural Nation when we moved to Auckland from Northland. When we moved to Auckland, we had a change in lifestyle; one gigantic cleanse. It's just kept going from creating skincare that I love to use and that is natural, cleansing, great for the body, and great for the skin. Natural Ingredients are also better for our environment, which lead to the process of going plastic free within the business and within our home. In doing this I have found some amazing products/brands that I love. I decided to stock those too as I could, and slowly build the business while making these changes alongside what we are doing at home. Do you think natural beauty products and homewares are just a fad? I really hope not, and I don’t think so at all. I think as a society and a community we are slowly discovering that simple is in fact better, that these strategies are worth putting into place; not only for the planet, but for our health as well. I think it is definitely a process that involves finding what works for you and what doesn't. What is your favourite plastic-free alternative? My favourite is definitely the Rethink produce and bulk bin bags. These are multi use, and I carry one with me pretty much everywhere I go: in my bag, the car, if I want a bagel or something that would usually come with plastic. They are also machine washable and beyond universal. By far my favourite. What is the most popular product on your site? We have 2 best sellers on the site. The Natural Nation Kawakawa Balm is a massive seller and a great healer, our customers are becoming more aware of what they are putting onto their bodies for healing. Our Kawakawa Balm is perfect for so many things. The Rethink Produce and Bulk Bin Bags are also a huge seller, as people are becoming more and more aware of their plastic consumption. These bags being a great place to start on the plastic free journey. For the month of July, use code PFJ20 for 20% off all stock items! -minimum order $30 limit one per customer.